Earlier this year before a gathering of engineers, geologists, metallurgists, and other mining industry professionals, Baqun Ding, Ph.D., a member of IPA’s Core Review Board, presented a few sobering slides illustrating mineral asset project outcomes predictability. Based on a review of approximately 30 mining projects completed over a 7-year period from 2006-2013, actual project outcomes for asset operability, cost, and schedule expectations were often wildly off target. Indeed, analyses of actual projects show that Industry ranges of variation are significantly wider than the ±10 to 15 percent that Industry typically uses for sensitivity analysis as presented in financing decision documents. Ding described the following project outcomes during a presentation and panel discussion at the Society for Mining, Metallurgy & Exploration Inc. (SME) 2015 Finance Conference. Planned production targets for projects from 7 to 12 months after startup fell short by an average of 20 percent. Some hardly produced anything. While projects overran cost plans an average of just under 10 percent, a vast majority experienced significant cost overruns, offset by some others with massive underruns. Projects, on average, experienced schedule slip of nearly 20 percent. Poor performers on average slipped their schedule as much as 80 percent. 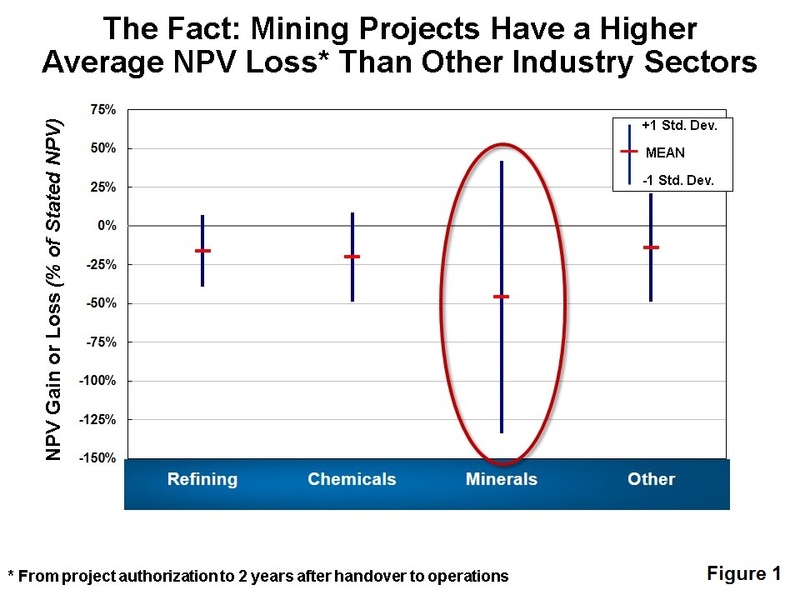 Tellingly, compared with other industry sectors, mining industry projects experience higher net present value (NPV) losses, and much higher NPV gain/loss variation (Figure 1). It is commonly understood across the Industry that project fundamentals, including the project scope, ore body definition, mining and facilities process technology, and operational management systems, affect NPV certainty. But what the Industry regularly overlooks, Ding explained, are the ways in which project development practices drive project value changes. Our data show that most of the leading performance drivers of mining projects are less defined than other industries,” he said. IPA has quantified the effects of mining project practices to improve the Industry’s understanding of key NPV drivers. By collecting and analyzing project knowledge and work practices data, such as basic engineering and team development planning information, as well as reviewing a team’s understanding of the ore body to be mined, IPA can rate the definition and planning work process (Front-End Loading [FEL]) completeness for a project. 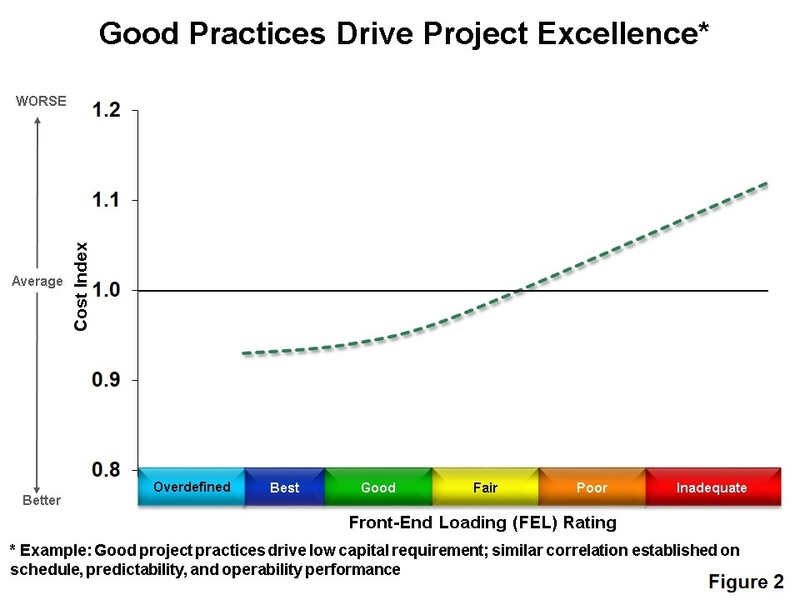 As a project’s FEL rating gets closer to Best Practical, its cost performance is shown to improve, Ding said (Figure 2). However, from facilities definition, to team integration, to project execution planning— also drivers of project performance outcomes—the minerals Industry lags behind other industry sectors. “A lot of fundamental project definition work is simply not getting done. As a consequence, projects are losing value that, in many instances, could be preserved,” Ding said.